For those who do not know, a permacath is a tube that is used to gain access to the blood for haemodialysis. You are awake when this procedure is done. I had to have a tranquilliser to knock me out a bit to help me even get on the table to have it done. I’m sure that different Hospital all around the world have different procedures but this is my example at the Health Hospital in Cardiff. After the tranquilliser, you go into the “line room” it sort of looks like an operating theatre only smaller with less equipment. There was two people with me; the doctor who would be performing the procedure and a nurse would be helping but also looking after me. You lay flat on the table and a plastic sheet is put over you & your face and I was told to look to the left (so away from where the op was happening). There was coldness as they swabbed the area to disinfect it. Then there was the worse bit; the doctor injected the local anaesthetic into my chest – this really stung but the nurse held my hand all the way through and I squeezed when it hurt. The injection quick goes to work and your chest/shoulder goes numb. Before the doctor started the procedure she kept asking me if I could “feel that” (I couldn’t) but I think she said she was poking me with scalpel. The doctor (or the nurse at times) kept talking to me, telling me what was happening and when. The operation is done in 3 stages – she would say. Stage one was to cut a small incisions in my chest and then at the top of my collar bone and feed the tube between the two holes. This was also a rough bit, not because it hurt but because to get the tube under the skin and out the other side meant that there was a lot of yanking and pulling. While I was numb so there was no pain, I could definitely feel the pulling and tugging. 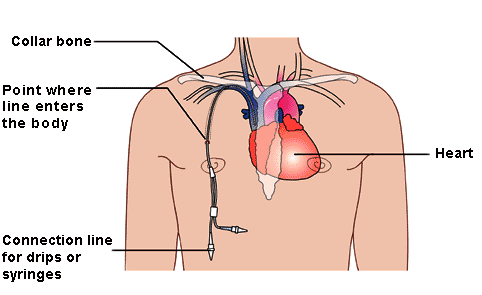 Once the tube was in position, the tube is inserted into the vein and feed directly into the heart (using an ultrasound machine for guidance) – this is stage two. Again I felt no pain but as the tube goes into the heart the doctor (on deliberately) pushes too far and the tube hits the side of heart – causing my heart to beat quicker and it also made me cough- it’s a really weird sensation! Once the tube is in, it’s time to sew me up. Stage three! By this time the local anaesthetic was wearing off and I could feel the stitches so I got some more of the nasty injections (which again really hurt), and I couldn’t feel a thing. All sewn up, I was about to sit up and have a look. All in all the operation takes about 45 mins to an hour. The tranquilliser did help, at one point during the procedure, I started to giggle with no idea why and felt relaxed about what was happening. The insertion of a permacath sounds horrific when you say it out loud and there is no shame in being frightened – but I can say with hand on my heart the the op is no where near as bad as it was in my head! 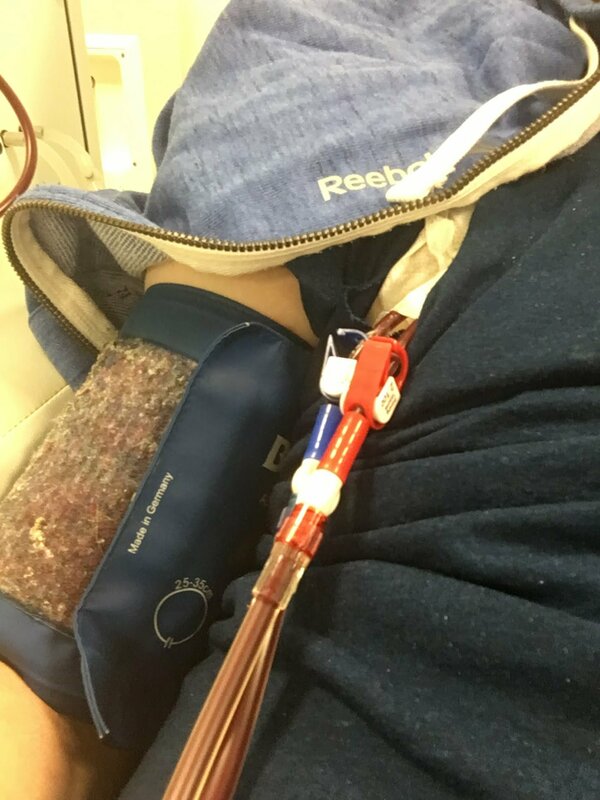 Within the hour of having it put in, I was on the dialysis machine having my first haemodialysis! Next story Keeping in touch!